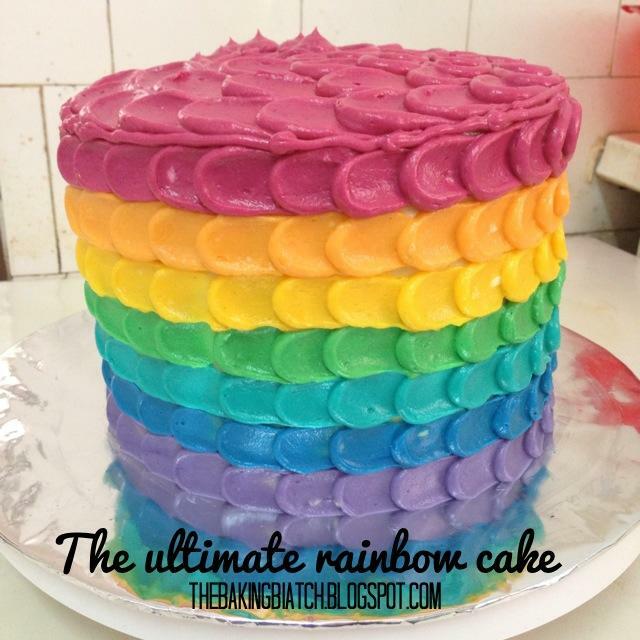 The Ultimate Rainbow Cake. One that would wow the socks off people you gift it to. I've done a couple of Rainbow cakes but this is just about one of my very favourite. 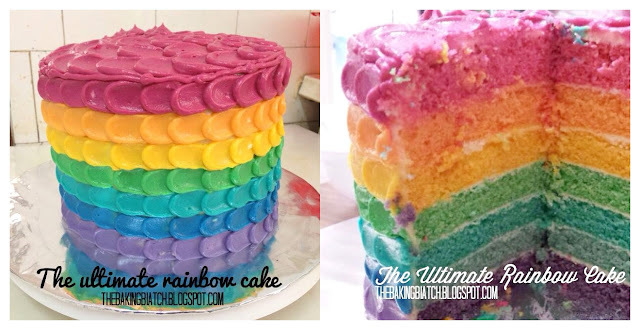 I challenged myself to match the layers with the Rainbow Petals on the outside. Well, I guess teaching has taught me one thing: PATIENCE. It was also a good time for me to take time off all the marking and lesson preparation to do what I like best: baking. It's already my 7th week into teaching and I am pretty much enjoying myself. It's not just delivering syllabus.. but helping kids. I become like a mother to some of my kids cos' they don't get the right support at home. It opens my eyes to the many sufferings of the world too, and in turn, be more thankful for the many good things I'm blessed with. Oh yes, speaking of blessings.. I've FINALLY GRADUATED! It's been a long long journey. But I've made it! When people tell you that you'll get no where with a low PSLE score, don't take them for real. I completed PSLE with 186. I was a "goner" in many people's eyes. Headed to Normal Academic in Xinmin. "Wasted" a year more than my peers. Thankfully, I did fairly well during my N and O levels to do my Diploma in Early Childhood Education. 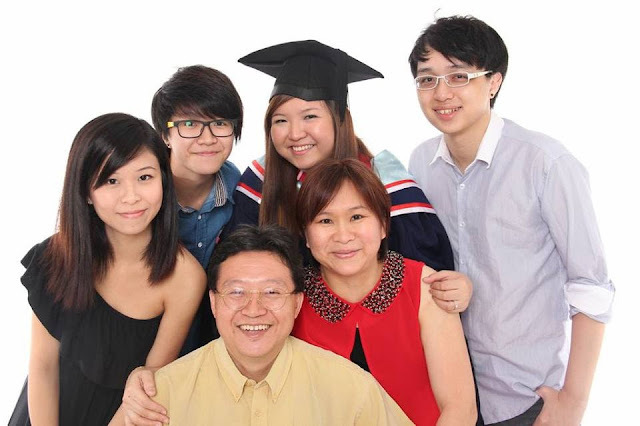 Then I "wasted" more time to do my second Diploma in Education with NIE. By God's grace, I crossover and did my degree with two years of no pay leave. After going one big round, I graduate today. So not doing well for PSLE is not the end. You just need that "waking moment". That aside,without my family, friends and the fav boy, I would never have gotten this far. It hasn't been easy by truly, with God's grace, I've made it! Praise The Lord! I'd rate this a difficulty level 5 out of 5 and it takes about 4 hours in all to complete. Click on for the recipe..
Preheat oven to 170 degree Celsius. Sift the flour, baking powder and salt. Allow butter to 'warm' up to almost room temperature (I usually cube my chilled butter and let it thaw for 10 minutes in room temperature) and add the castor sugar. 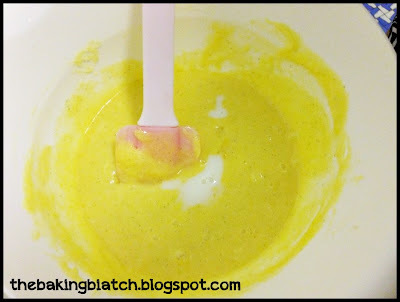 Whisk together till creamy. 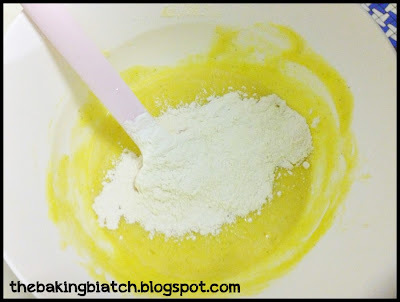 This can be done using a machine whisk or even a hand whisk (with some determination of course). Add an egg. Mix well. 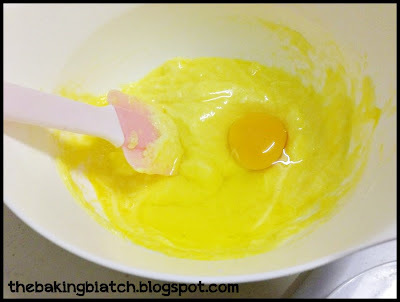 Add the other egg and mix well. Add in the vanilla bean paste. 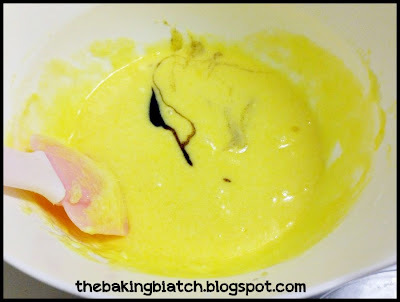 Try using vanilla bean paste rather than vanilla essence/extract as it tastes so much better. The other two are just so artificial. 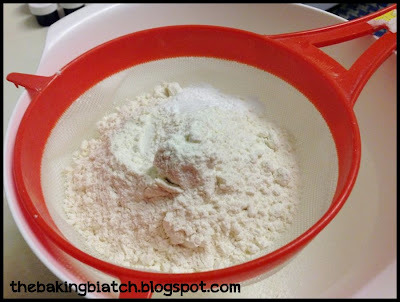 Add the milk and flour mixture alternately, 1/3 portion at a time, ensuring that each layer is well mixed before adding another. 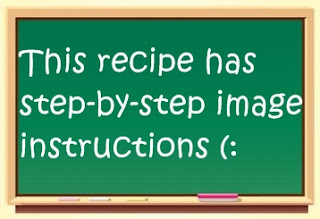 Remember to mix it well! 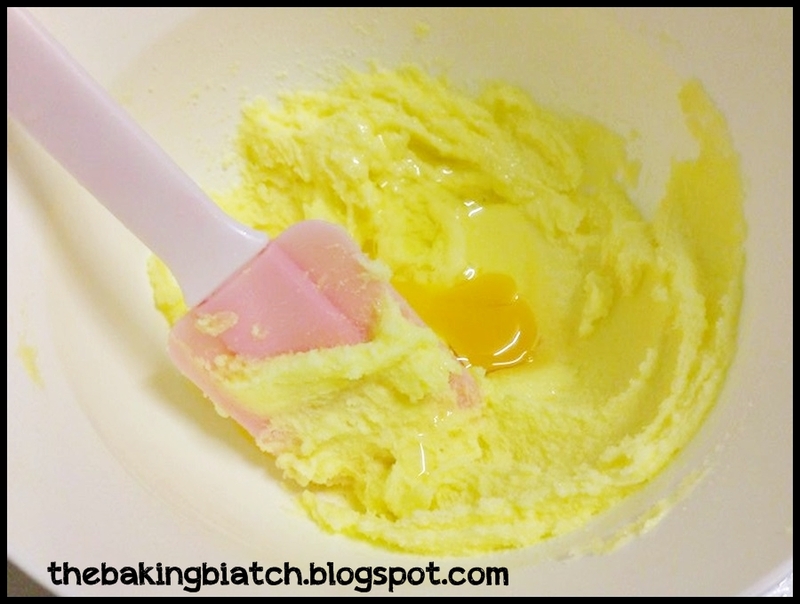 Weigh the batter ALONE. 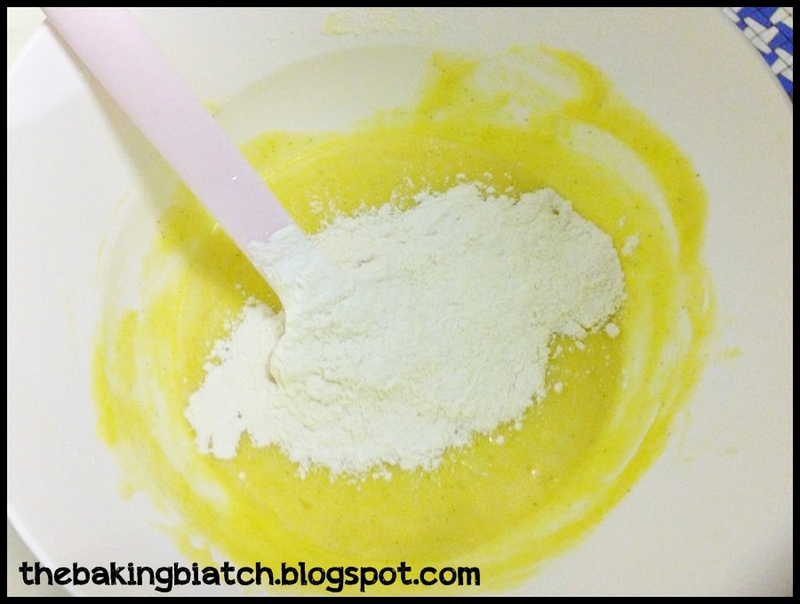 Split batter into 2 equal portions. I had each portion at 310g - 320g. 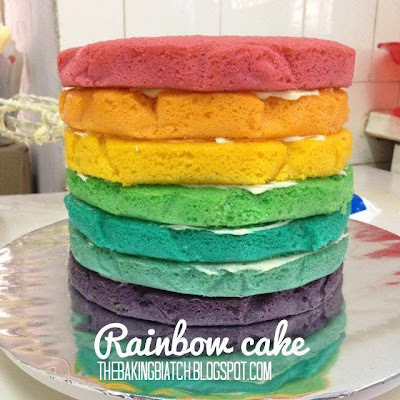 Colour each portion accordingly with a small portion of food colouring. Pour one portion of batter into a 8" round baking tin lined with baking paper and spread it as evenly as you can with a spatula. It will be good to have 2 baking tins so that you can rotate them. Bake for 12 - 15 minutes or till' cooked. Remove cake from baking tin and allow cake to cool in a cake caddy/air tight container. Bake remaining 6 layers and allow to cool completely. 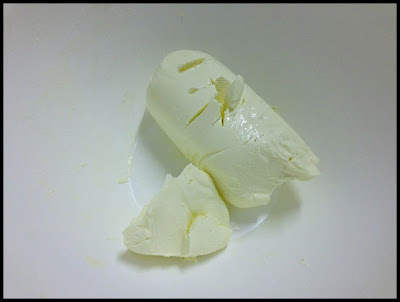 Have the cream cheese come close to room temperature in a mixing bowl for about 10 minutes. You may cube it to allow it to 'thaw' faster. Using a spatula/hand whisk (I prefer a spatula), whisk it vigorously by hand to cream it. Alternatively, use a machine whisk. 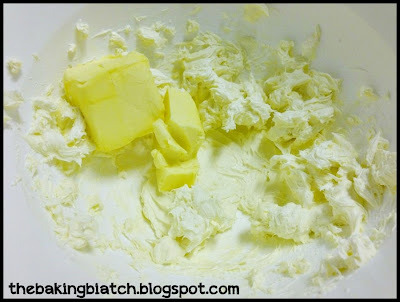 Add cubed butter of room temperature (cube and thaw in room temperature for 10 mins) into cream cheese and whisk vigorously. 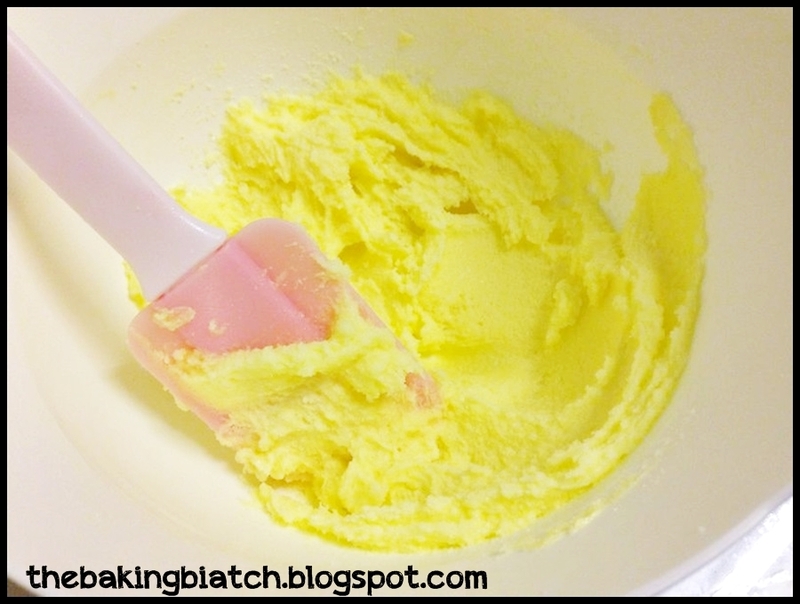 Or if you're lazy, use a mixer! You'll get a mixture like this. Have one layer in the middle of the cake board (I used a 13" cake board). 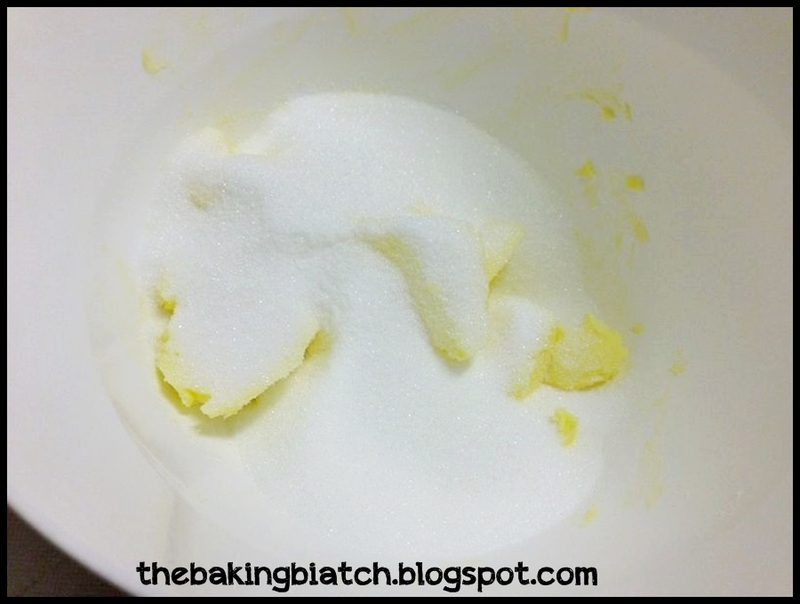 Spray with a small amount of sugar solution to keep the cake moist. 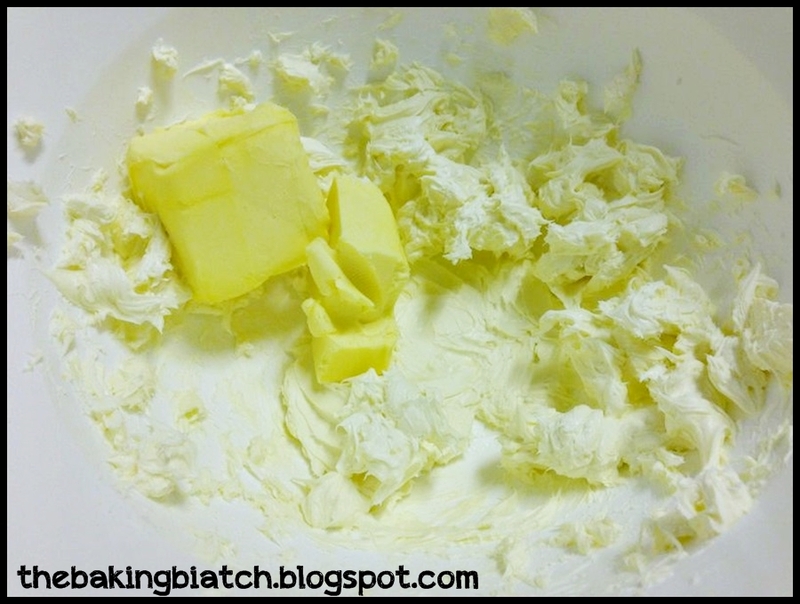 Apply a layer of cream cheese filling (about 1/8 of the cream cheese). Add second layer. Do handled with care. Repeat steps for remaining layers. 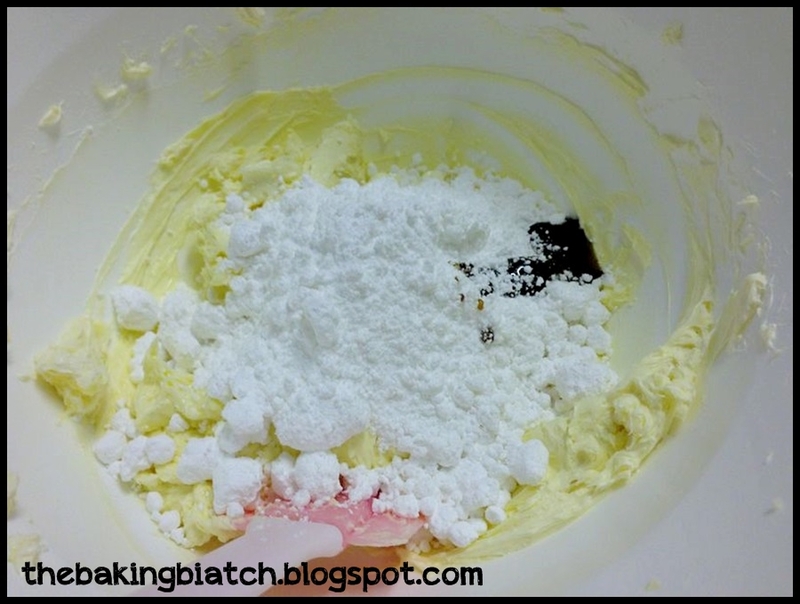 Use the remaining 2/8 or the cream cheese to coat the entire cake. 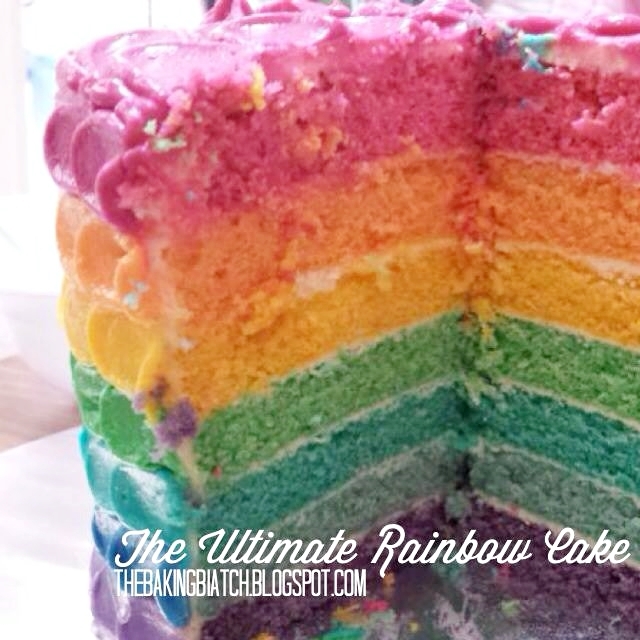 Prepare rainbow petals cream cheese frosting with the same steps used for the filling. Divide into 8 portions and colour accordingly. Here's a video tutorial for the piping of the petals. For this particular cake, I was mindful of the size of my petals as I wanted them to match each and every layer as precisely as possible. I also made them smaller and more dainty using an angled spatula instead of a teaspoon. The petals bit needs patience but the results are well worth the effort. Hi Cynthia, can i know the tip size you use for piping. Thank you. Hello! I can't remember the size. But it was a round tip of probably 1cm in diameter. May i knw where to get the vanilla bean paste? i only have vanilla extract at home..
You can get them from Phoon Huat! (: extract works as well but it will not taste as good. Most of my skills are self taught so sorry, haven't got any particular school to recommend to you. I did however attend a series of demo only classes in CCs as well as a hands on creaming class (but I didn't attend all lessons). How come my cake texture more towards dense but not fluffy looking like yours. the food colouring colours the batter. the yellow is not coloured yellow so it allows the food colouring to colour it. 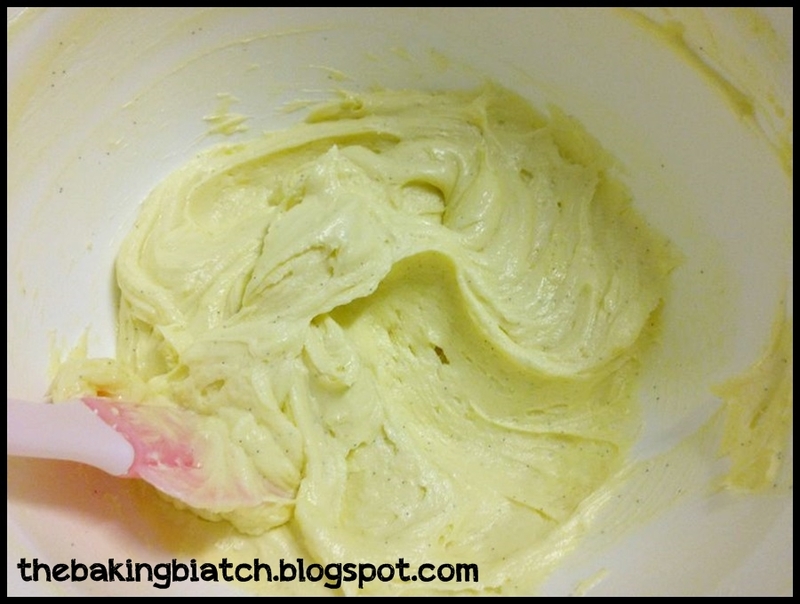 And wilton gel colouring is perfect for it. I used violet, royal blue, teal, leaf green, lemon yellow, orange and maroon (for this cake) though I'd substitute with pink or red at times. 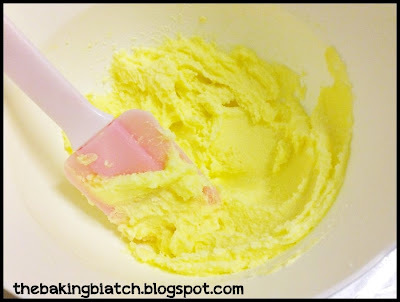 Hi Cynthia , may i knw wat is a vanilla bean paste ? where can i buy it ? and also , is it possible to exclude the vanilla bean paste ? will it make any difference ? WOW YOU'RE GOOD!!! 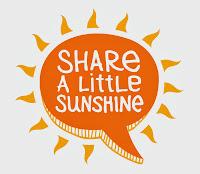 I'M BOOKMARKING YOUR SITE! it's a kind of flavouring. it can be purchased from baking shops like phoon huat. please do not omit it.. it gives the cake very good flavour. Hi can I use self raising flour instead of plain flour? no. they're completely different flours. Would like to check with you about the stability of the frosting. Will it 'weep' in our hot weather (Singapore) approx after 30mins? between the cream cheese version and the swiss meringue butter cream version, which one tastes better? 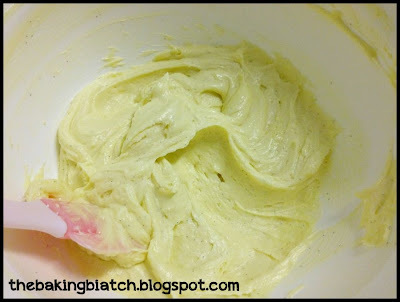 for cream cheese frosting, does it goes well with dense cake or light airy ones are also ok? 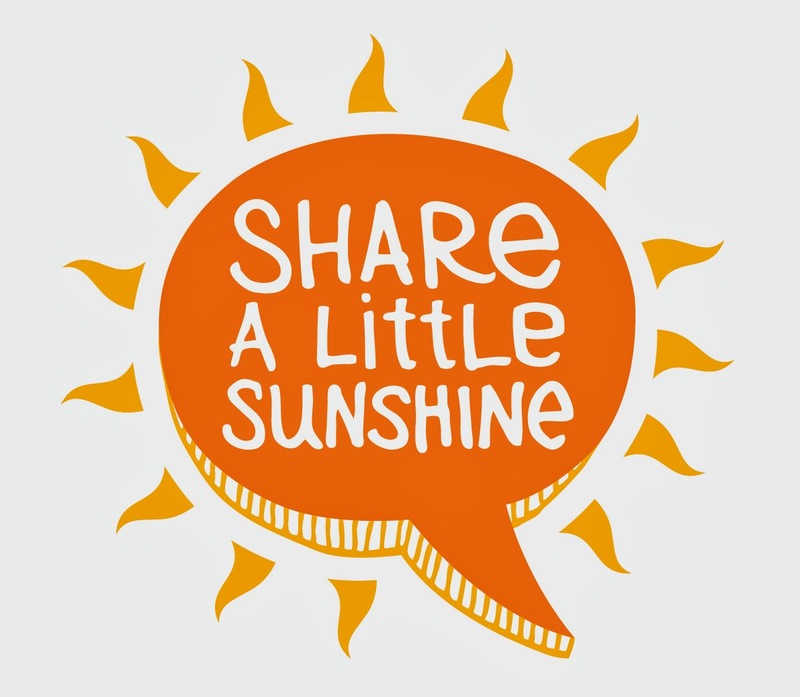 That greatly depends on your personal preference. Works both ways. What is snow powder and how does it look like? it's something similar to icing sugar. You can get it from baking shops. I am planning on doing this cake for my son's first birthday which falls on 10 Oct. How early can I prepare the cake layers and the frosting and when can I assemble the cake? Sorry, im a novice in baking. assuming you're having it on the 10th, you can bake it on the night of the 8th.. frost and assemble it on the 9th and chill till you're ready to have it. I got two 9" tins. Possible to use this recipe or you able to provide me another suitable recipe? Do I need to store the 1st batch layer in airtight container while doing the remaining layers? Btw, I only got 6 colors. you can leave them outside to cool which the other layers bake..
R u referring to this recipe that's easier to work with? But i onli hv a 6inch pan. Does it work? I can do 6 layers instead of 7 layers. U said cake flour is fine. But will it also turn out slighly soft compared to if use plain flour? Can i also confirm i can reduce sugar by 20%? Tks! yes this is the one. 6" is fine, just that your layers will be much thicker. or you can play around with the proportions to get lesser batter. Hello Cynthia! I baked my cake layers today, but will only be assembling them tomorrow.. Do I have to keep the cake in the fridge? If so, do I need to "defrost" them before frosting them tomorrow? I don't usually refrigerate these layers if I'm assembling it the next day. It'll be good to store them in an air-tight container though! I don't weigh the cakes I make. You can roughly calculate the quantity you need with the mass of the ingredients used. May i know the sugar solution is it spray to each layer before apply the layer cream cheese frosting? Can I use fondant instead of cream cheese frosting? I whld like to bake on a 9" tin, if the layer is thinner will it collaps easily?